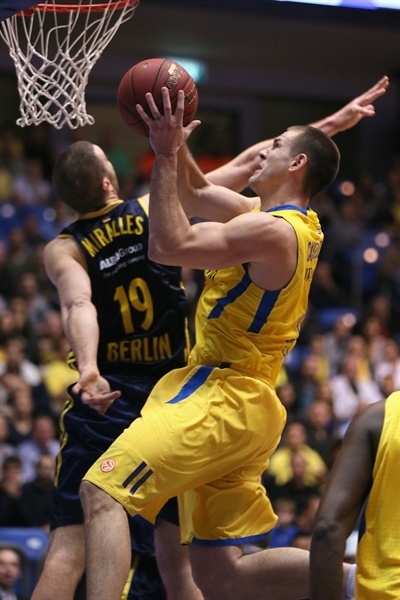 Maccabi Electra Tel Aviv took care of Alba Berlin 78-62 on Thursday night at Nokia Arena to clinch first place in Group B. The Israeli champ dominated the first half and led by 24 at the break en route to the win. Maccabi finished the regular season with an 8-2 record; Berlin, which is also headed to the Top 16, placed fourth in Group B with a 4-6 mark. Alba never quit on the game and closed the gap to 8 in the fourth quarter, but Maccabi’s big lead proved to be insurmountable. 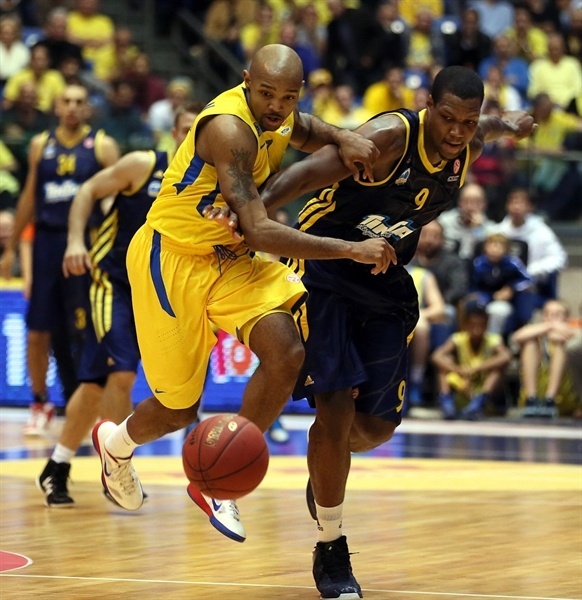 Ricky Hickman paced Maccabi with 17 points and 5 assists, David Logan added 15 points, Yogev Ohayon scored 14, Sylven Landesberg 13 and Shawn James tallied 10 points, 10 rebounds and 3 steals. Deon Thompson led Alba with 16 points, 10 rebounds and 3 steals, Nihad Djedovic added 13 points, Derrick Byars 12 and Heiko Schaffartzik accounted for 10 points and 5 assists. Deon Thompson was the first one to find the net with 2 free throws in the early going, but Hickman needed a few seconds to answer with a huge three and an off-the-steal fast-break layup to set a 5-2 edge for the hosts. 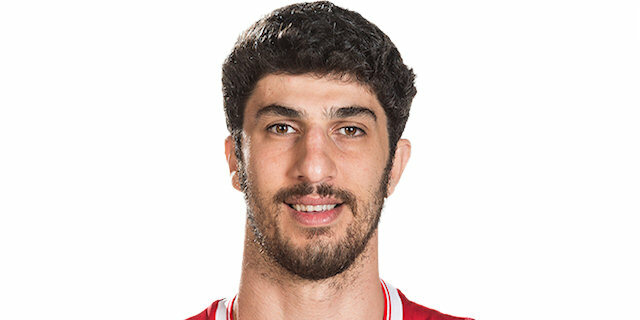 Alba struggled on offense, turning the ball over, as Ohayon kept rocking for the home side to make it 7-2 after three minutes. Thompson came to the rescue with a basket and a monster fast break dunk, since no other Berliner seemed to be ready to contribute yet. Things got worse for Maccabi when Nik Caner-Medley had to leave because of a leg injury, joining Guy Pnini and Devin Smith on the sideline. Ohayon took over with a nice layup, followed by an impressive reverse dunk by Malcom Thomas to prevent Alba from taking the lead midway through the first quarter. Heiko Schaffartzik became the first player besides Thompson to add points for the visitors, and he did it from behind the arc to make it 11-9. Alba Berlin increased the pressure on defense as an attempt to change the pace of the game, and it seemed to work fine as Thompson and Byars combined to answer Thomas and keep Maccabi close, 14-13, entering the last two minutes. But Sylven Landesberg decided to help his team then, scoring 4 points in a row followed by a deep three by Logan to build a solid 21-13 lead in a blink of an eye. Alba was held scoreless for the last two minutes, as Logan beat the buzzer and capped a 9-0 run with a nice turnaround jumper to close the first period with a comfortable 23-13 edge for the hosts. 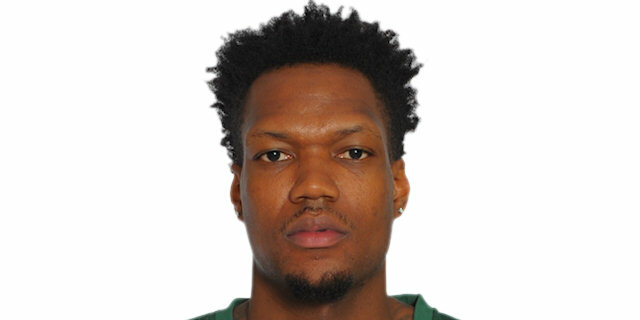 Shawn James got going, completing an amazing play where Maccabi had two blocks in a row, the last one by James. James kept rocking, adding another basket and another block against a stunned Berlin team, which found itself 12 points behind after only 12 minutes. The show didn’t stop here, as Thomas brought fans to their feet with a terrific one-handed dunk-plus-foul. Ohayon joined the party, nailing a three and adding an easy layup to make it a 20-point game, 35-15, digging Alba’s grave even deeper. James added free throws before Nihad Djedovic ended the offensive drought for the visitors with a layup right before the TV timeout midway through the second quarter. Maccabi’s production decreased a little bit after that, but Alba was unable to score on a regular basis, getting lost against Maccabi’s defensive effort. As such, the hosts didn’t find trouble keeping their big lead, which reached the 22-point mark after a fast-break two-handed dunk by Logan that made it 43-21 with a minute-and-a-half to go. Byars answered with his first three of the night, but Hickman needed just one attempt to reply and break Alba’s zone defense with another bomb of his own. Hickman remained hot, and capped a difficult drive with a nice off-the-glass basket to send the game to halftime with the yellows doubling Alba, 48-24. Thompson came out strong, scoring 4 points in a row and showing much more energy for the visitors. Maccabi was held scoreless for the first two minutes until James found an inside basket, but Berlin looked like a different team at that point. Djedovic and Schaffartzik combined for a 0-6 run that reduced the margin to 50-34. Logan came to the rescue with a long three, but Morley banked a short hook to keep Alba in the right mood. The differences remained steady for a while, but it was clear that Maccabi had lost its momentum on offense already. Alba reduced the margin even more, 55-40, through Djedovic, who added a second chance layup, right before Logan sent the ball to the stands on Maccabi’s next offense to force Coach David Blatt call an urgent timeout with less than four minutes to go in the quarter. Schaffartzik cooled the atmosphere even more with another triple to make it a 12-point game and even though Landesberg replied with a bank shot, Morley and again Schaffartzik cut the deficit to just 10 points with back-to-back layups entering the last two minutes of the quarter. 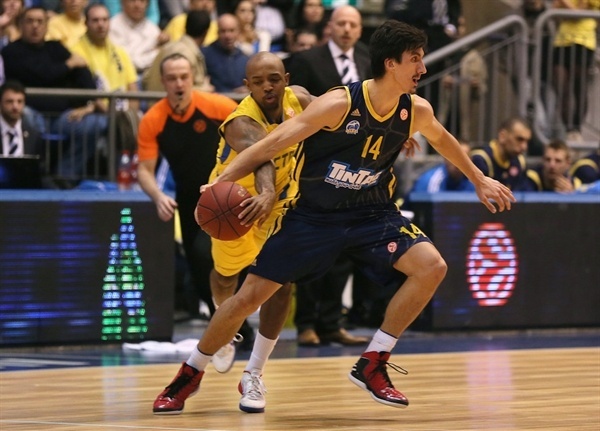 Maccabi’s timeout proved useful, as Ohayon managed to break Alba’s zone defense with a three. Alba missed on consecutive offenses, but Albert Miralles managed to grab an offensive rebound and close the last quarter with Alba still alive, 60-49. 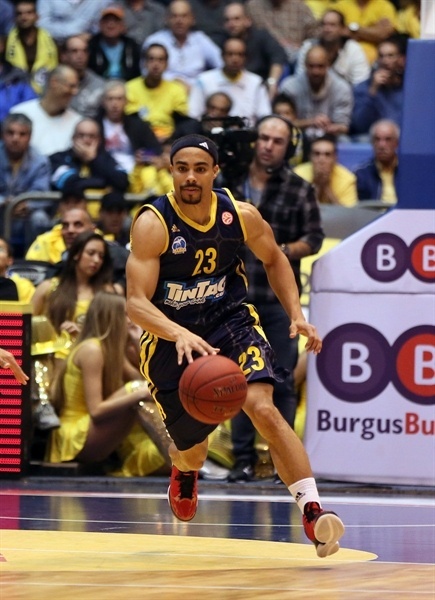 Logan didn’t panic, and showed up again with a deep three-pointer to keep the Maccabi fans calm. Byars answered then, punishing another turnover by the home team, while Djedovic followed him with a layup to make it a 10-point game once again. Even though the margin was still big enough, Maccabi showed anxiety, turning the ball over too often and wasting open shots. Miralles returned the lead to single digits, 63-55, fed by Schaffartzik, turning the lights to red for the home side. Maccabi’s crisis didn’t go further because Alba wasted consecutive offenses and allowed Ohayon first, and Landesberg later, give some breathing room to the hosts. A three-point by the latter returned a safe margin, 68-55, with only five minutes to play. Maccabi seemed to have recovered confidence, as Hickman nailed a well-guarded three pointer, answering a previous short jumper by Thomas. Alba tried to repeat the comeback, but with less than three minutes to go, they needed quick points that they tried to get from the three-point line. The Berlin shooters didn’t produce, and even though they got second chances through offensive rebounding, points didn’t come. 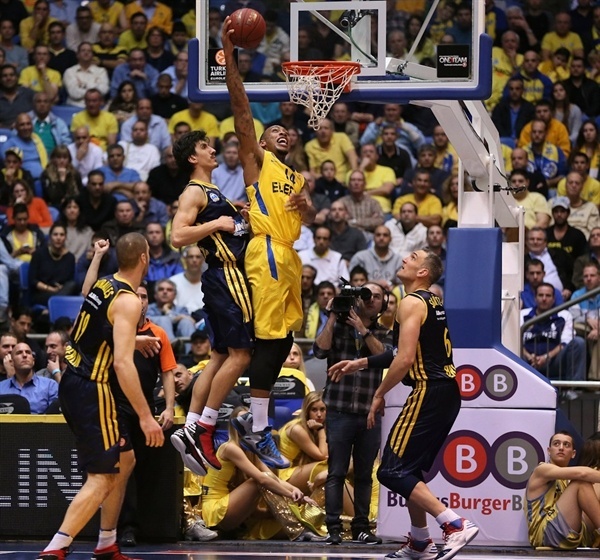 As such, Alba remained scoreless for almost three minutes, which was exploited by Maccabi to consolidate the advantage and increase it step-by-step, 76-59, entering the last minute. Logan added his 15th point with everything decided, while Byars added the last three of the night to close the game with a 16-point home win that sends Maccabi to the Top 16 as Group B winner. 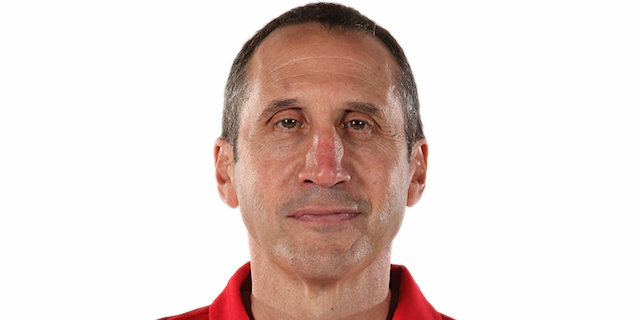 "We had a great regular season considering we finished at the top spot and it's almost a totally new roster. We knew how to win tough games, and gain some confidence. I'm very happy with our team, but we will need to see how we play better in the next stage ,which will be much more difficult than before with the new system. Today we missed some players, played one bad quarter, but three good ones that were enough to win." "Congratulation to Maccabi. They were better. Like in the first game between the teams, in the first half we didn't respond well. We gave them too many easy points. I'm glad my team reacted and in the second half we showed a much better game. We reached our goal to make the Top 16 after six years. We're looking forward to it. We don't need to give the opponents as much respect as we do. 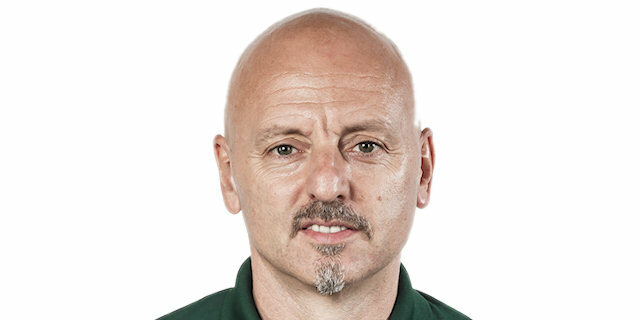 We need to play hard from the start to beat big teams like Maccabi." "We wanted to finish in first place in our group and we did that. Alba is a tough opponent. Just like in the first game with them we started very well, and had a big lead, but they came back and showed us how dangerous they can be. The Top 16 is a different story. We will have very strong opponents and our fans will get to watch the best teams of Europe here. It's going to be exciting." "We didn't start the game well. Their pressure on defense gave us trouble running our sets, but you gotta give us credit for not giving up. We came back in the second half determined and didn't fall apart. 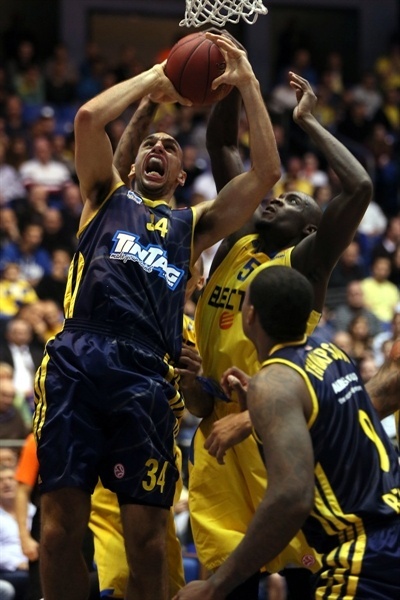 When you dig a hole that big against Maccabi, or any team like that, you make your life very difficult."